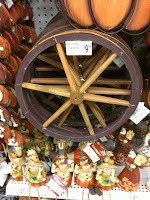 > I was indulging my need for new Halloween decorations (yes in the middle of July) when I came across a Wagon Wheel. I hanker for a hunk-a cheese! Now that you all have Time for Timer stuck in your head, what could anyone possibly do with this? Set up a diorama of the Old West? >Hmmm. I was thinking it could be a fun frisbee for a dog. But, no, my dog lets hers hit her in the head sometimes. I'm stumped. >Interesting thought. Clearly I'm not creative enough to figure out what to do with random bits of vehicles.